Did Land O’Lakes’ lesbian CEO stop the company’s support for a neo-Nazi Congressman? 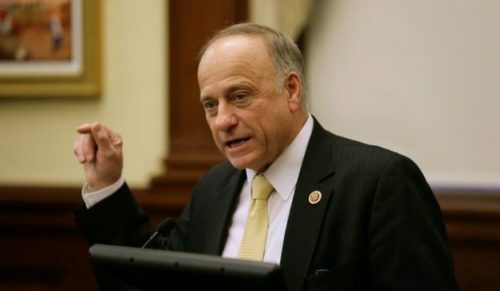 Land O’Lakes has withdrawn its support from Representative Steve King (R-IA), after a campaign donation made under its previous CEO came to light. According to the Federal Election Commission, Land O’Lakes’s PAC gave $2500 to King’s reelection campaign on June 29, 2018, a month before Beth Ford was named CEO of Land O’Lakes and became the first lesbian CEO of a Fortune 500 company. To say that King is a controversial figure would be an understatement. He has made extreme statements for years, and this past year has been more open about his support of white supremacists. He has displayed a Confederate flag on his desk and retweeted a Nazi sympathizer. He tweeted support for a Canadian who lost her job after she did an interview with a neo-Nazi website. Last month, he did an interview with Austria’s Freedom Party, which was founded by a former Nazi officer. “Western civilization is on the decline,” he said in the interview, and he also decried racial diversity. He defended the interview after the synagogue shooting this weekend by saying that the Freedom Party is Austria’s equivalent to the Republican Party. After news about the campaign contribution broke yesterday, calls for a boycott of Land O’Lakes started. Or we can boycott LandOLakes products. No need to wait for an explanation. I've always used Land o Lakes. I'm going to miss it but I will not see one hundredth of one cent of my money in that fool's pocket. It didn’t take long for Land O’Lakes to withdraw its support from King. Earlier today, the dairy company issued a statement. The Land O’Lakes, Inc. PAC has traditionally contributed to lawmakers of both parties that represent the communities where our members and employees live and work and are also on committees that oversee policies that directly impact our farmer owners. We take our civic responsibility seriously, want our contributions to be a positive force for good and also seek to ensure that recipients of our contributions uphold our company’s values. On that basis, we have determined that our PAC will no longer support Rep. Steve King moving forward. Land O’Lakes, under its previous CEO Peter Janzen, donated twice as much to Republicans as to Democrats. The current CEO, Beth Ford, took the position on August 1, and may be more hesitant to openly support right wing politics. Now if only they would do something about the drawing of a stereotypical Native American woman in their logo….